Like Dr. Jeffrey Cohen and other Jewish doctors and nurses who treated the wounded, raving and murderous anti-Semite who'd just slaughtered 11 people at the Tree of Life synagogue in Pittsburgh. Cohen is a member of the Tree of Life synagogue. The killer -- I will not mention his name -- committed the worst act of anti-Semitic murder in American history. Yet when brought to Allegheny General Hospital, Cohen and others -- Jews and non-Jews -- treated the hater with care. "He got great care here," Cohen, president of Allegheny General, told a British TV station. "Many of the people who attended to him were Jewish. And they're heroes. They did like the cops did. They did their job. They went and confronted the problem, and they're true to their core beliefs and I'm very proud of them." Cohen said his job wasn't to judge the man but to take care of him. "I went up to meet him. And I was just curious to, who is this guy?" Cohen said. "And, quite honestly, he's just a guy ... people say he's evil, (but) he's some mother's son. And how did he get from that to where he is today? That's going to be a large debate that we have to wrestle with as a society." In the immediate aftermath of hate directed at the innocent, Cohen and Rabbi Jeffrey Myers and others at Tree of Life expressed something desperately needed by all of us: a demonstration of decency. They followed the ancient teachings of the Torah. "What you hate for yourself, do not do to your neighbor," the famous Rabbi Hillel once said. "This is the whole law; the rest is commentary. Go and learn." Yet look around you, just days before the midterm elections, and you will be hard-pressed to find decency in American politics. What we hate for ourselves we do to each other, with gusto. There has never really been much decency in politics, the dark art of who gets what from government and who pays. And what we're witnessing now is a fight for federal power, following the collapse of a cynical establishment center that was destined to fall of its own corrupt weight. That establishment still holds on, in the American palace of Versailles that we call Washington. And like Versailles, Washington is complete with guardians, mincing courtiers and sophists. They play for time. Without a center to hold, the leftist blue and conservative red face off, each demanding that the other bend the knee in capitulation. But capitulation is not compatible with decency, is it? If you insist on thinking as a child, you may believe that the anger started with the election of Donald Trump as president in 2016. But it didn't. This has been much longer in the making. And some who read the culture think we're on the precipice of civil conflict, as America was in the late 1700s with the Expulsion of the Loyalists, and the mid-1800s and the Civil War. There are righteous coalitions at each other's throats, and little room for fence-sitters. Those with whom you disagree are to be demonized, shamed and cast out. And the witless are the first who reach for a gun or bomb or an envelope of poison. I think we're smarter than that, and if we hold to the Constitution and the Bill of Rights, and understand the reason we fight each other is that our federal government is far too large and powerful, we may avoid it. But our discourse makes me wonder. You might like your tax cut because you can finally pay your bills. But others will shame you and say that your greed has cost people their lives. Your free speech about what kind of country we want to live in -- one with sovereign borders, or one with liberal immigration policy -- may trigger some unhinged nutball into violence. But if violence comes, even if you did not tell the nutball to pull the trigger or mail the bomb, you are to be shamed into silence, lest you incite others. This is how free speech is throttled now. And, as it is squeezed, things become worse. We've already seen those ugly confrontations at restaurants, a deranged leftist's attempted massacre of Republicans at a congressional baseball practice in which U.S. Rep. Steve Scalise almost lost his life. We've seen suspicious packages of explosives sent to Democrats by a deranged right-winger. 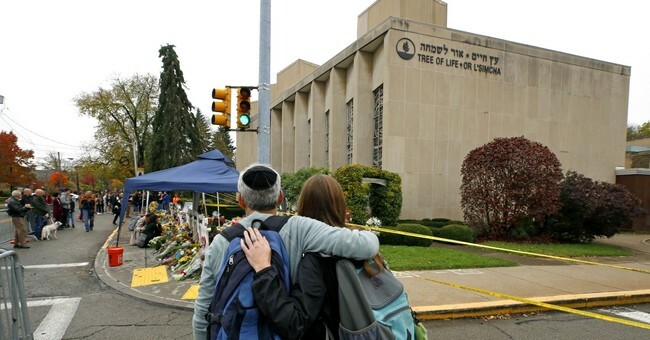 We've seen the slaughter of those 11 innocents at the Tree of Life synagogue, with the dead immediately transformed into political weapons even before their funerals. All these are symptomatic of our national state of mind. You understand this most dangerous game: Your visceral beliefs grant you moral superiority and entitle you to view me as shameful. Do my beliefs entitle me to moral superiority over you as well? Democrats and much of the media say it's all Trump's fault. Republicans and conservatives say the blame lies with Democrats and their media allies. But as you vote, you might want to think of the old Jewish teachings, taught again to all of us the other day: What you hate for yourself, do not do to your neighbor.